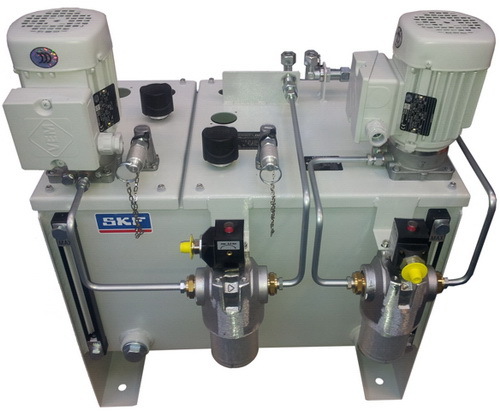 SKF CircOil Lube System: FLO Components, Value Added Partner and Distributor For SKF Brand Circulating Oil Lubrication Solutions – Oil Conditioning System, Fluid Circulation System – FLO Components – Automatic Lubrication Systems Specialist in Ontario and Manitoba. 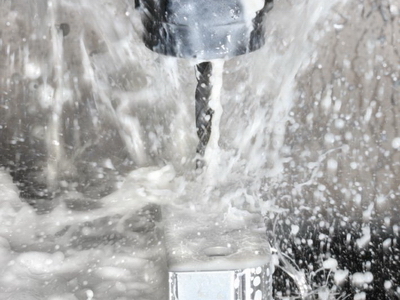 Contamination is a fact of life in many mill systems. Conditioning oil with a Circulating Oil Lubrication System will contribute greatly to optimizing the lubrication and maintenance of your critical equipment. 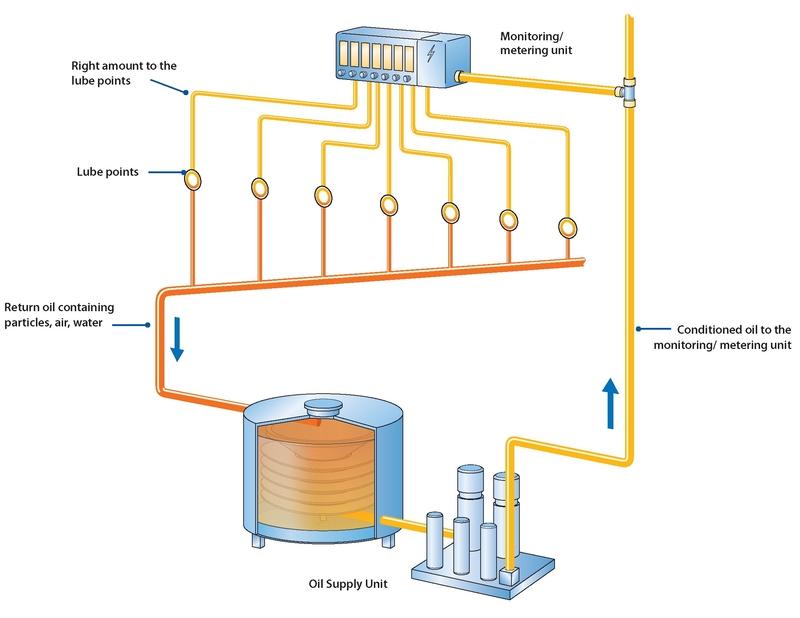 In contrast to total loss lubrication systems (where lubricant is not collected after it is applied to the lube point), in a CircOil Lube System, after the oil passes through the lubrication point, it is collected and reused. In addition to lubricating, circulating-oil systems perform a range of other functions, including: maintaining the lubrication points at a proper temperature, filtering out wear particles from friction points, preventing corrosion, and removing water condensation. Oil stored in the Oil Supply Unit is continuously pumped out and separated by hydraulic resistors (orifice tubes, adjustable metering valve distributors, throttles, etc. 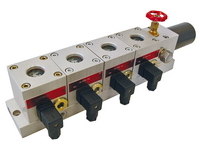 ), flow limiters or progressive feeders, or multi-circuit pumps (multi-circuit gear pumps or multi-circuit piston pumps with one pump each per lube point). The right amount of oil is distributed to the lubrication points. The actual feed rates can be controlled visually or electronically. Monitoring systems with individual warning levels are available for a more predictive maintenance approach. Once it’s passed through the lubrication points, oil containing particles, air and water is fed back through a return line into the Oil Supply Unit where it is reconditioned and reused. 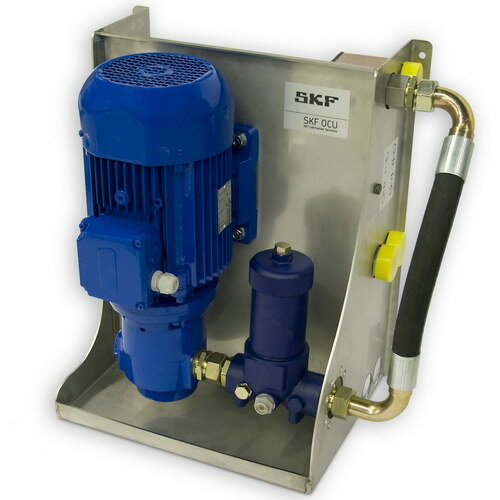 SKF Oil Conditioning Units are low-volume off-loop or kidney loop systems. 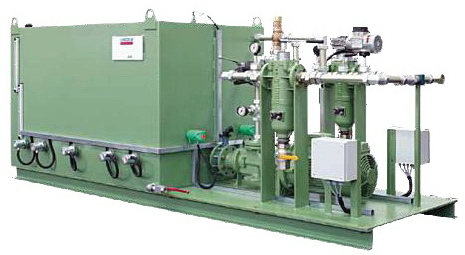 Installed directly onto existing machinery, a unit provides continuous oil filtration to remove contamination and includes a cooler to maintain the operating temperature of lubricating oil. It helps to: protect machinery from unexpected failures; protect oil, extending its useful service life; and extend machine service life by reducing wear and improving lubrication. The design is fully integrated with a minimal number of connections and apart from periodic filter changes, there is no need for regular maintenance. 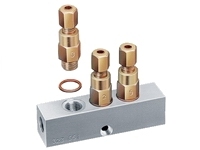 These units are used effectively in many applications such as large bearing housings, compressors, turbine systems, vacuum pumps and gearboxes. They can be useful on machinery where the existing filtration is not satisfactory or does not exist. 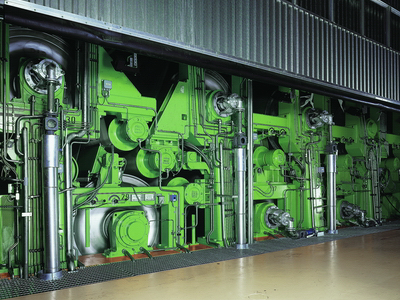 SKF Compact Circulating Oil Lubrication Systems are complete, self-contained systems designed for smaller applications such as stamping presses, punch presses and crushers. 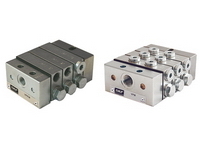 Each unit is locally assembled and tested for flow, pressure, sound levels and proper operation. Standard units usually include: electric motor and pump, oil filters, level indictors, flow meters, pressure gauge and steel oil reservoir. 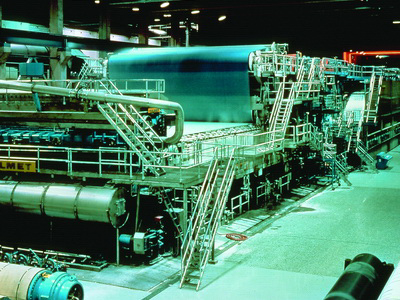 The SKF Flowline system was developed to provide superior air and water separation performance for industries with high-volume oil circulation applications for cooling and cleaning the lubrication points, such as Pulp & Paper. The system works at high temperatures and eliminates contaminants such as abraded particles, oxidized particles, water, and air bubbles. Traditional systems use large reservoirs, have typically less than half of the oil in effective circulation, and have inefficient air and water separation. 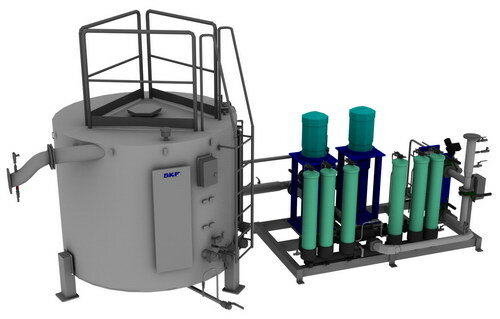 The Flowline oil reservoir’s revolutionary construction provides a better oil utilization ratio (over 90%), superior removal of air bubbles and water, has a volume only 1/3 to 1/2 of traditional reservoirs, saves energy by using a variable frequency AC-drive, and dramatically reduces oil consumption. FLO’s Lincoln Fluid Circulation System for open gears and support rollers has been developed to be able to use highly viscous lubricants specifically designed to suit the operating conditions of large girth gear drives. 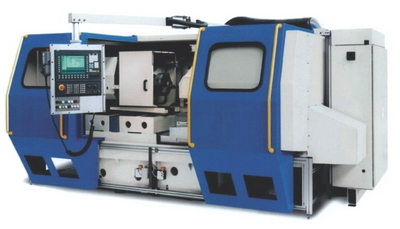 It can be used for lubricating single, double or multiple pinion drives. 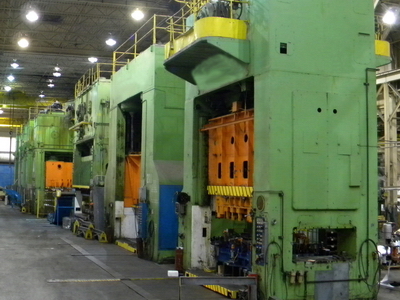 Lubricant is continuously applied to the gears, collected, filtered and returned to a reservoir to be re-used. The lubricant is taken in either via an immersion bath or via a separate reservoir, pumped through lubricating pipes and excessively applied onto the load-carrying tooth flanks, as the machine operates, to clean and cool the driving pinions. The separate reservoir system version also allows heating of the lubricant for outdoor applications during winter seasons. 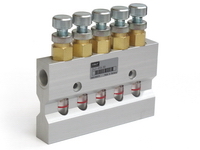 A complex filtering component ensures that the lubricant is free from contamination. 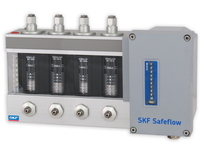 FLO’s CircOil systems include a wide range of tailor-made and turnkey solutions for flow rates from 0.1 to 300 l/min. 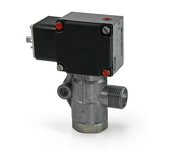 • Monitors flow of oil to a lube point, or a continuous flow of oil through an entire system. Contact us now with your application details. Based on your information, we will recommend the best Solution to meet your application’s specific requirements.